Do check out the show’s Facebook page, and our social media channels for the latest updates and photos! After sold-out ‘A Cappella Night’ and ‘Jom A Cappella 2016’ shows two years ago, our friends at The Vochale Project (TVP) are organising the comeback of the largest Malaysian a cappella event of the year, and we’ll be taking to the stage with 5 other groups in the Klang Valley – TVP, Nuance5, Fancy Poultry, SAB A Cappella and Flag Nation! Are you a hidden bathroom singer who desires to belong to a like-minded community? Well, wait no more! Join your fellow Rakyat on 15th September to sing your patriotic hearts out celebrating Hari Malaysia. A cappella renditions of nostalgic Malaysian tunes will be presented by 6 local a cappella groups, bringing their own distinct flavour to the table like a delicious plate of nasi lemak with non-crispy rendang. So will you be our crunchy ikan bilis? June 19, 2016 September 14, 2018 snlsingers Our Shows! A Cappella Night 2016 – A first in the Malaysian a cappella scene! It was such a blast performing to a full house at #ACappellaNight2016 @PJ Live Arts Theatre, organised by The Vochale Project and featuring some of the top a cappella groups in the Klang Valley! A first in the Malaysian a cappella scene, A Cappella Night brought together seven groups in the Klang Valley showcasing various genres of music using only their voices. Featured groups: The SnL Singers, SAB, The 4 of Us, Nuance5, Tapestry, Colour of Voices and The Vochale Project. April 9, 2010 April 7, 2012 snlsingers Corporate Functions, Our Shows! 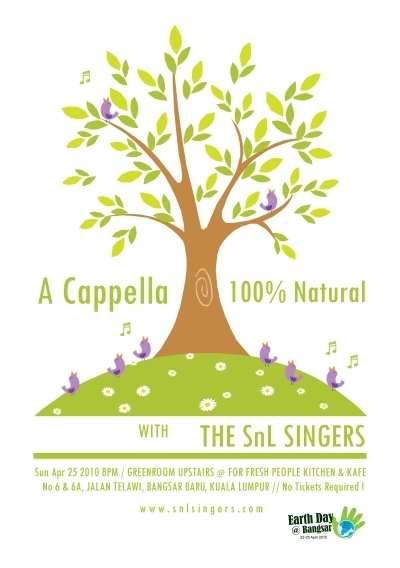 The SnL Singers will be performing at the Greenroom Upstairs @ For Fresh People Kitchen & Kafe, April 25th 2010, 8pm! This event is in conjunction with Earth Day @Bangsar. No tickets required! Just come, for an evening of refreshing contemporary, jazz, pop & local numbers, a cappella style! Post-event Update: View photos from the performance, on our Facebook album, here!